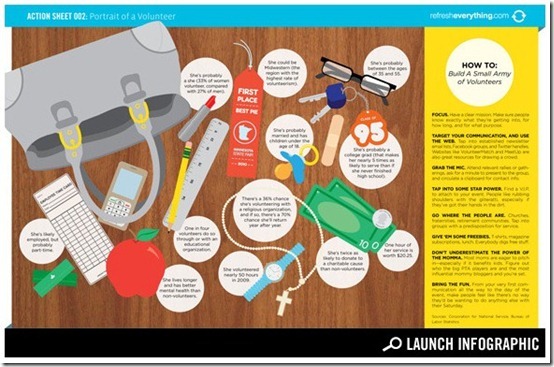 This action-packed infographic from the Pepsi Refresh Project presents a picture of the “typical” volunteer. It’s worth a look for several reasons – both for what it says (and why), and for how the information is presented. Click through to the infographic to interact with it – you can pan and zoom around to view the whole thing. She’s likely employed, but probably part-time. She’s probably between the ages of 35 and 55. She’s probably married with children under the age of 18.
Who is your “typical” volunteer? Drawing on the data your nonprofit has collected about its own volunteers, could you create a similar “portrait” to help guide your volunteer recruitment and retention strategy? When you have a clear view of who you’re talking to, it’s that much easier to find the right words. Could you create a similar profile for your organization’s members, its donors, its advocates – and maybe even, if your mission is in support of a contentious issue, a protrait of those in opposition?